Today's color challenge combination on SCS is just beautiful! Real red, taken with teal, and certainly celery. I came up with a quick and easy card, case-ing from Stamper's Success magazine. I stamped the teal layer with the Polka Dot background in teal ink, stamped "happy" with versamark and embossed in white, and attached the whole layer to a celery base. I tied a soft sky ribbon knot around the card. 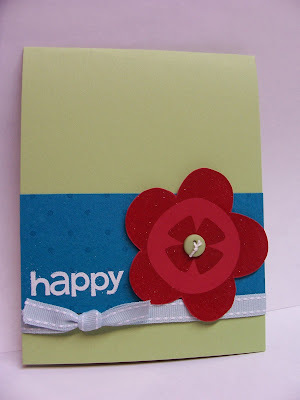 The flower is stamped with versamark on a real red scrap, clear embossed, cut out, and attached to the card with dimensionals. I put a little white crochet thread through the button and attached it to the flower with a glue dot. Great job on the color challenge today, I've got to make myself do those challenges this year. Great blog, so glad I stopped by and got to know you. Happy 2008. Cute card, Becky! This is a really nice color combo! I may have to go do this color challenge! This is really cute! I love big blooms and this is one of my all time fave color combos. I admire how many challenges you do! I just can't keep up!